Increasingly international, increasingly business-oriented and with even more services and opportunities, Expo Riva Schuh is getting ready to welcome buyers and operators from the worldwide footwear sector at the event, which has always been the traditional starting point for the opening of the seasonal presentation calendar. 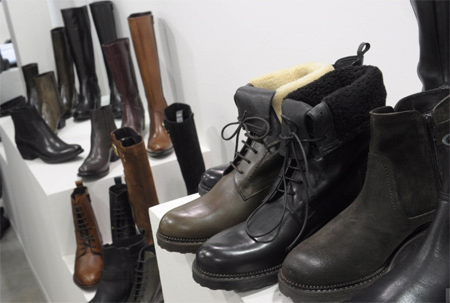 The 84th edition of Expo Riva Schuh, scheduled for June 13th to 16th 2015, strikes at a crucial time for the worldwide footwear sector, which for a while now has been showing some encouraging signs of picking up. The event has always offered a privileged observation point from which to test the moods and trends of the international market, and this appointment in Riva del Garda represents the ideal opportunity for checking out first hand whether or not these indicators do indeed mean a turning point and steady growth for the entire sector. With over 1,300 exhibitors, of whom around 70% are foreign, and in excess of 12,500 visitors from over 100 countries, Expo Riva Schuh is an open door to the most important players in the footwear sector, capable, in one single event, of offering a complete overview of the world’s supply and demand. The international element has proved, over the years, to be one of the greatest strengths of the event, and during recent editions has seen stronger links developing with strategic partners and targeted activities towards emerging countries. With regard to the exhibiting companies, for example, Expo Riva Schuh has recently signed an important three year collaboration agreement with the five key Chinese agencies who represent the companies who come to the event from China almost in their entirety, and is also at work to renew the agreement with CLE, the Council for Leather Export, to boost Indian participation. With products on show that range from low cost Asian production to the offerings of Italian brands, and including products from the South American countries that combine research, design and competitive pricing, Expo Riva Schuh offers buyers, who come from all over the world, the chance to develop a variety of purchasing tactics, fundamental in being capable of responding to the ever-changing market demands. This flexibility has proved to be key in offering viable alternatives to buyers from the Russian area, who have discovered concrete solutions at Expo Riva Schuh, to meet the new needs of a market that was strongly hit by the ruble crisis and international tensions. As the first date in the international fair calendar, Expo Riva Schuh is now getting ready to show off the collections for Spring/Summer 2016 and to be the absolute first to reveal previews of the most up-to-date trends that we can look forward to for the next hot season.